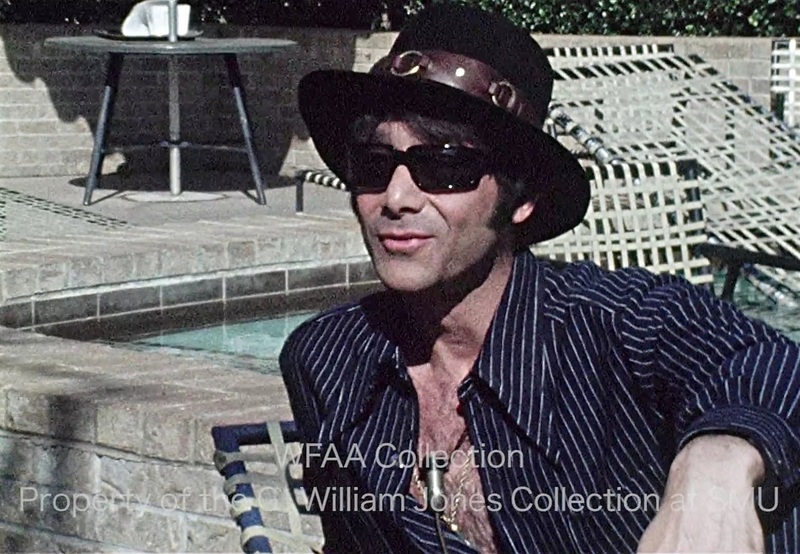 I’ve written about the interesting old WFAA Channel 8 news footage which was either never aired or was aired decades ago and hasn’t been seen since (such as newly discovered Jack Ruby footage and a fantastic short interview with Jimi Hendrix at Love Field), which is part of an ongoing digitization project by SMU’s Hamon Arts Library as part of the G. William Jones Film and Video Collection. There are so many (SO MANY!) quirky clips that are being uploaded to the web almost daily that it’s easy to miss the super-quirky. A week and a half ago the clip below was posted online, featuring an unidentified man who was much groovier-looking than one would normally have seen on the nightly Channel 8 newscast — he said that someone had shot at him from a car, just before dawn, near the Hilton Inn at Mockingbird and Central. 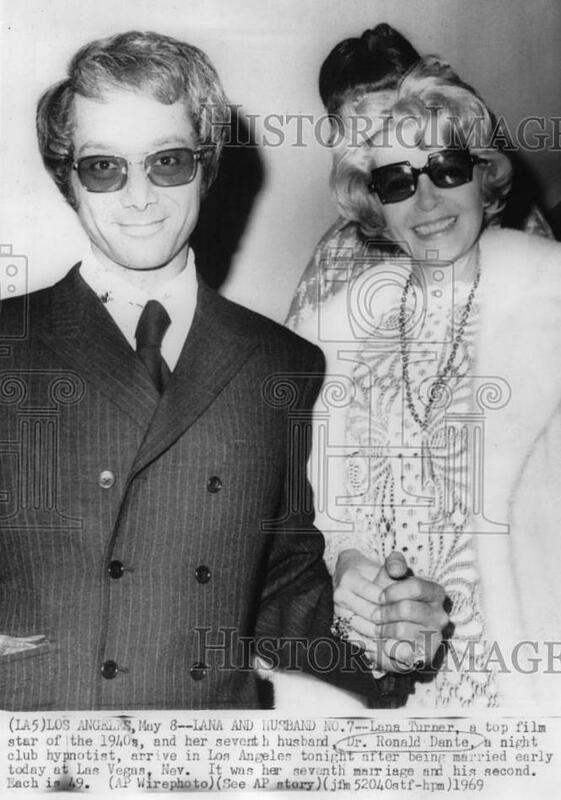 He seemed pretty sure they were associates of Frank Sinatra, who was not at all happy that our mystery man had been fraternizing with his daughter, the singer Nancy Sinatra. Take a look at this short (1:43) footage from May, 1970. Okay, that was weird. “I’ve been shot at *many* times — for one reason or another….” Add in an unexpected mention of Mrs. Baird’s bakery and, yeah, weird. Who was that guy? 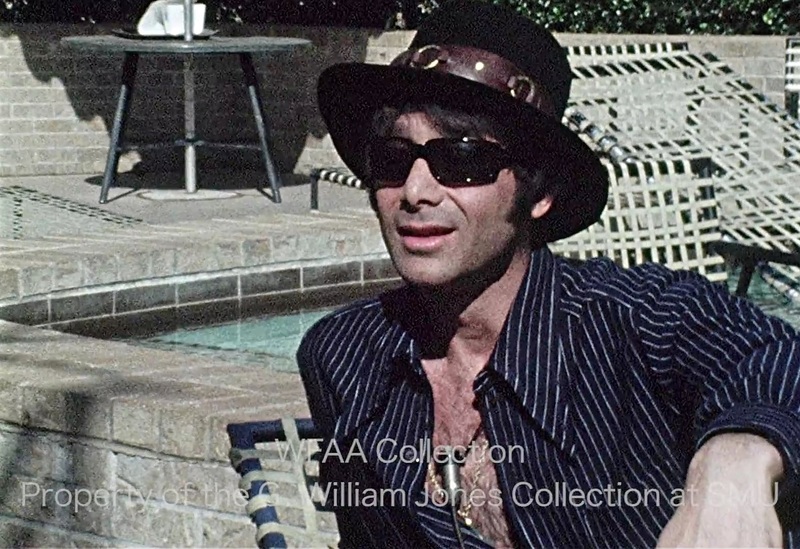 The only information the SMU digitizers had on the out-of-context snippet was that it was filmed on May 21, 1970. It was obvious the guy was not local and, with that voice (and apparent ready access to Nancy Sinatra), he was most likely in the entertainment business. I could find no mention of this incident in The Dallas Morning News archives — I tried using every conceivable keyword I could think of. Nothing. So I checked Newspapers.com and found an AP story about this which had run all over the country — just not in the city where the incident had occurred. The guy is Ronald Dante, who has gone by a variety of aliases but is generally known as “Dr. 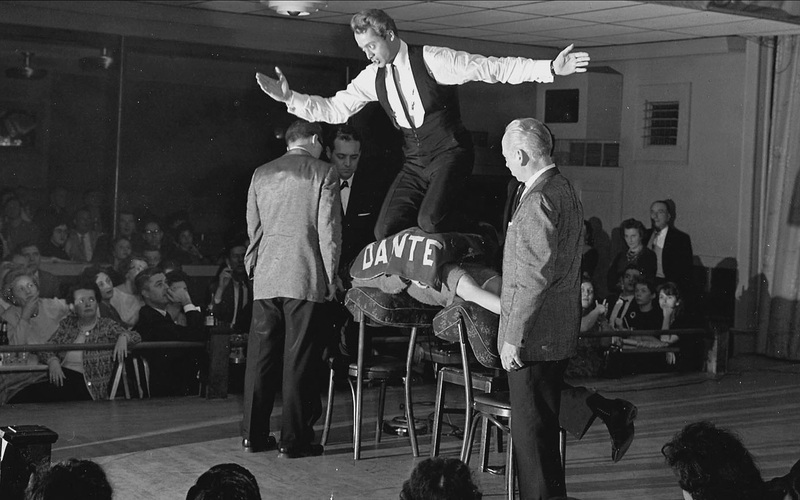 Dante,” the stage name he used for decades as a successful nightclub hypnotist. (According to a 1985 Dallas Morning News profile, he had legally changed his name from Ronald Hugh Pellar to “Dr. Dante” — with “Doctor” being his legal first name.) (This may not be true.) (Most of what Dr. Dante has said is not true.) At the time of the shooting described in the video above, he was performing in DFW. To describe Ron Dante (who was born in Chicago on Feb. 5, 1930) (and is not to be confused with the Ron Dante who was the lead singer of The Archies) as “colorful” is an understatement. His extraordinarily … um … extreme life as a performer, con-man, fraudster, schemer, opportunist, convicted felon, etc., is too much to cover here, but there is a fantastic 2006 profile of him from the San Diego Union-Tribune here (seriously, READ THIS! — the part about him being orphaned in Kuala Lumpur when his family was attacked by Malaysian insurgents is great — in actuality, U.S. Census records from 1930 and 1940 show that he grew up in a nice Chicago neighborhood with his very-much-alive parents and brother). 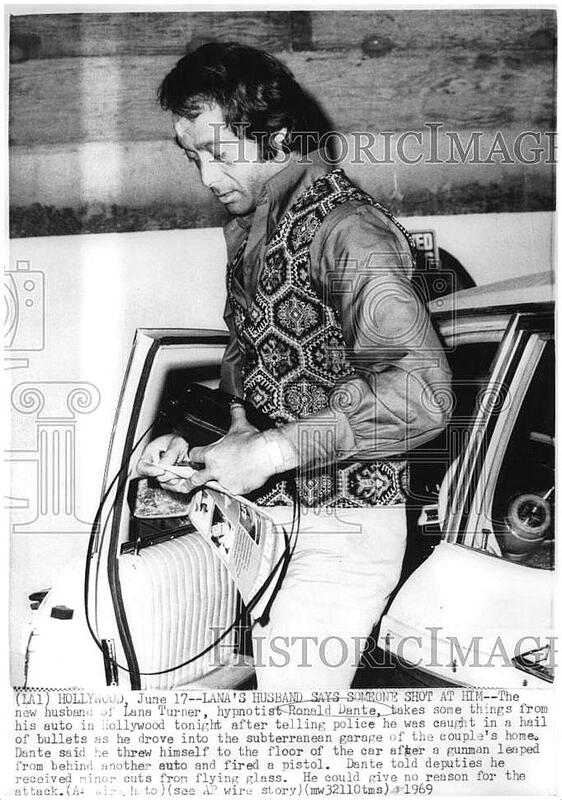 But back to Dallas in May, 1970. 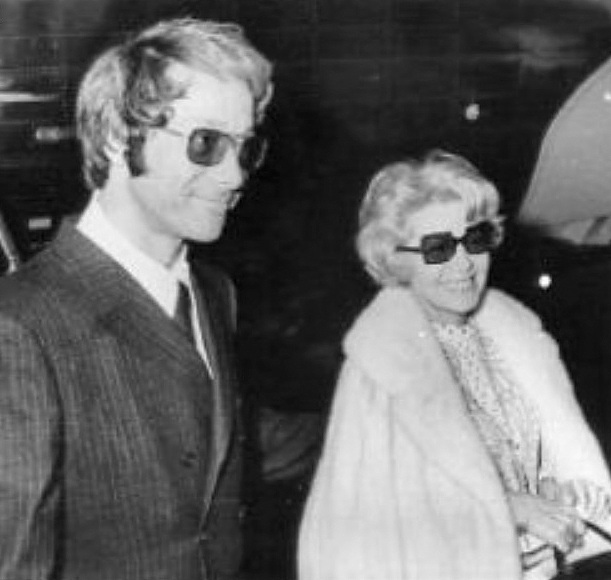 Dante was, at the time, the estranged husband of Hollywood icon Lana Turner. 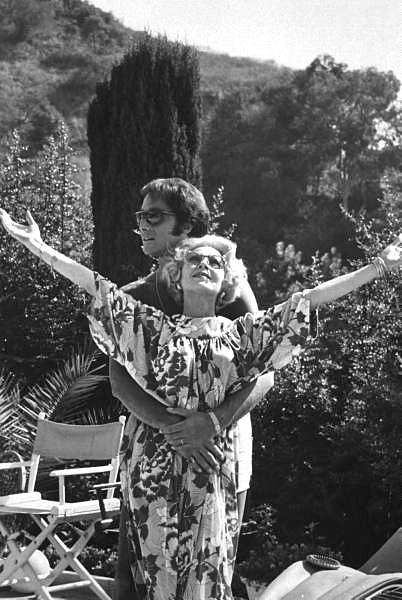 They had married in May, 1969; it was Lana’s seventh (and final) marriage. In news reports of the nuptials, Dante was reported to be the same age as his new bride, but he was actually almost 10 years younger. (In the Channel 8 video above he is 40.) Below are some photos of the happy couple before Lana began to realize what she’d gotten herself into. I never saw a follow-up, but whether the story was true or not, it was pretty ballsy to accuse Frank Sinatra (a man of known “connections”) of being behind something like this. Someone should crack open this cold case! An appearance by Lana Turner seems … unlikely. Others rumored to be appearing on the star-studded bill? Actor Ralph Bellamy, comedian Tommy Smothers, and … singer Nancy Sinatra. Unsurprisingly, none of the special guests showed up. 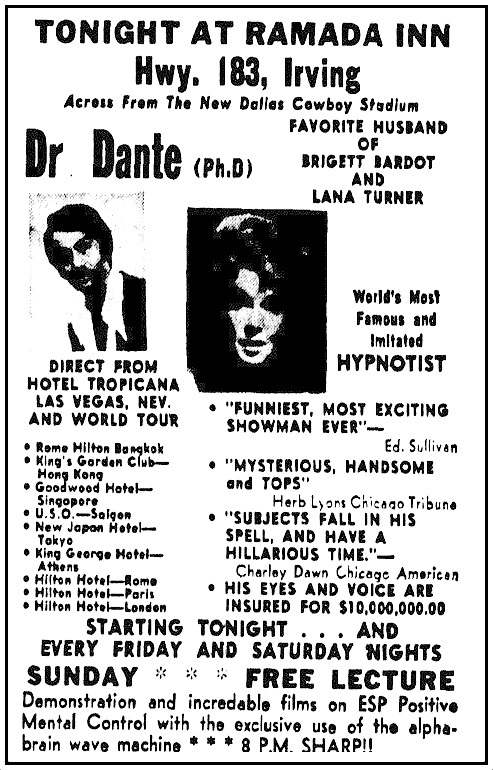 A couple of weeks after the New Year’s Eve engagement, an ad appeared in the paper filled with SO MUCH odd stuff in it: after a “world tour” which had him playing at swanky venues in Rome, Paris, London, Athens, Japan, and Bangkok, the next stop by Dr. Dante (“Ph.D.”) was none other than the somewhat less exotic Ramada Inn in the somewhat less exotic Irving, Texas; he billed himself as the “favorite husband” of both Lana Turner and “Brigett” [sic] Bardot (to whom he had never been married); and his eyes and voice were said to have been insured for 10 million dollars. Etc. In general, statements made by Dr. Dante were more likely than not to be absolutely untrue … untrue but usually pretty entertaining. 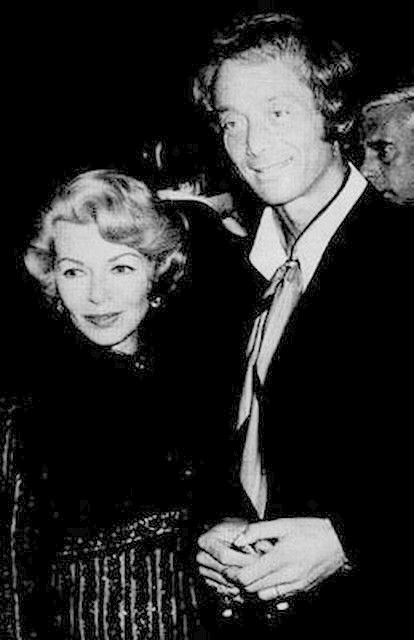 A year later, Lana Turner and Ron Dante were divorced — the judge ruled that Dante had defrauded Turner, dissolved the marriage, and “postponed indefinitely a ruling on community property.” That was soon followed by a string of weirdness including the bizarre case of Dante’s being charged with soliciting an undercover cop to kill a rival stage hypnotist (! ), creating a “school” to teach aspiring cosmeticians to administer permanent makeup (via tattoos), suing Johnny Carson for one billion dollars (“billion” with a “b”), and running an extremely lucrative diploma mill. (And that’s just the tip of the iceberg.) There were convictions and there was prison time. Whatever else Dante is, he is likable. Even the most outrageous statements seem strangely plausible when coming from his lips. That may be the secret to his success, says [District Attorney] Gary Kniep, who was alternately amused and exasperated during Dante’s attempted-murder trial. This was Dante’s closing statement to Muncie, Indiana reporter Betty Harris after a 1970 interview absolutely LOADED with whoppers. Can’t say she wasn’t warned! Photos of Lana Turner and Ron Dante are from Pinterest and eBay. 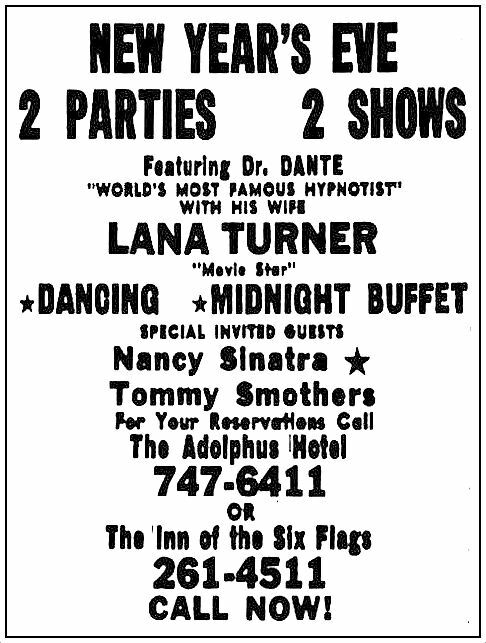 The photo of Dante performing in a nightclub was found on a page about Lana Turner on the University of Alabama site, here. 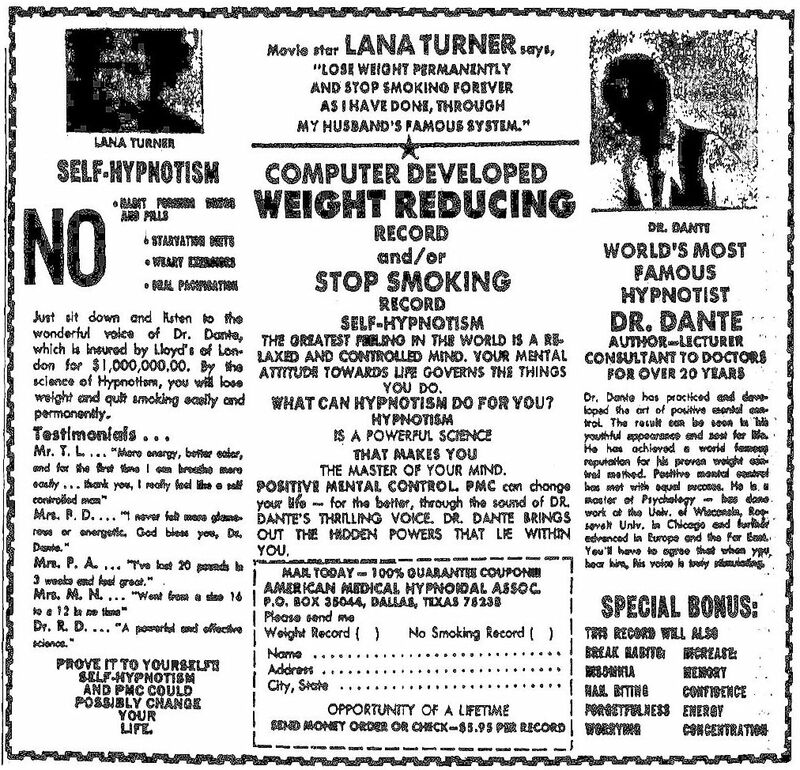 See Wikipedia for more on Dr. Dante and Lana Turner. I HIGHLY recommend listening to Jennifer Sharpe’s 6-minute 2007 NPR story on Dr. Dante (“Lana Turner’s Ex Maintains Dreams of Grandeur”), here (click the “play” button in the blue circle at the top of the page). The short film “Mr. Hypnotism” was made by her and Austin-based director Bradley Beesley — the full film is here, the trailer is here. Maybe Sinatra was not happy because Lana Turner was his old flame. Thanks, Terry! I added this to the post. It makes things even more combustible if Dante was actually cheating on Frank’s former girlfriend with Frank’s own daughter. 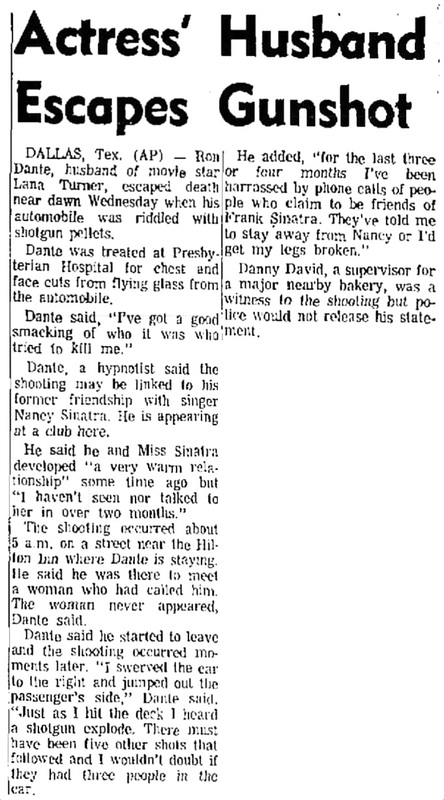 And, of course, it’s entirely possible there had been nothing at all between Dante and Nancy Sinatra. I have no doubt, though, that Frank was no fan of Dr. Dante.